No matter how the experts puts it, the way to accumulate wealth can always be deconstructed to a wealthy formula. If you know how to build wealth, the next question is how much do you need? In this article I will distill how much wealth you need to build up to achieve your financial goal. 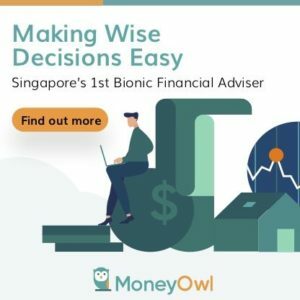 I believe you may have come to read this article, curious to find out how much you need to save up for your retirement. Indeed, many today were told to save up for retirement, but there are so many mixed signals how much is adequate. If you understand how retirement comes about, you may realize that its purpose and what you have in mind is very different. Far back as in 1881, people simply do not retire. There is no concept as such. As people do not retire, there becomes a problem of not enough jobs for all the people. The president of then old Germany was under pressure. So he came up with a system where the government will take care of those workers that are over 70 years old, if they every lived that long. The idea is not as a reward, but part of a government system who knew the workers won’t lived till that age, 65 or 70. I doubt that is what you have in mind. Knowing this, I doubt you want to accumulate a large sum of money, and not get to spend it. I believe you want your wealth to be more meaningful and useful for you. Which is why I feel building wealth for Financial Security and Financial Independence are more worth while pursuits. For simplicity, I may use FS to refer to Financial Security, FI to refer to Financial Independence, RET to refer to retirement in this article. Before I explain more on Financial Security and Independence, let me tell you the math behind how much you need to accumulate. When you know these 2, you can figure out how much you need. 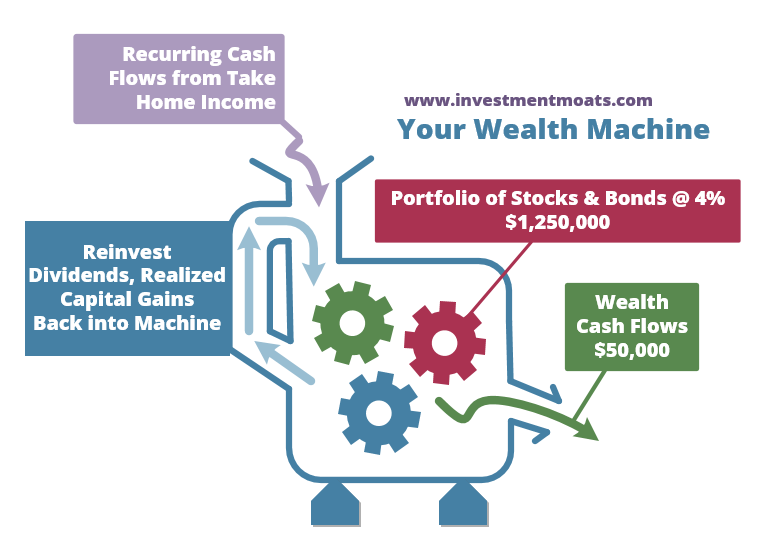 Wealth Machine(s) are the wealth assets that you acquire, or manage, that generates the cash flows. You set aside your disposable income, and put them in these machine(s) in order to accumulate wealth. Different wealth machines will have different rate of return. I have a comprehensive article that explain about Wealth Machine(s) and why you need them to build sustainable wealth. 1. Jack wishes to attain Financial Security. He has an annual survival expense of $20,000. He learns to manage a portfolio of real estate investment trusts (REIT) that provides a rate of return of 5%. To be financially secure, he would need $20,000/0.05 = $400,000 worth of wealth. 2. Andy wishes to attain Financial Security. He has an annual survival expense of $12,000. He channels his wealth into a portfolio of low cost exchange traded funds (ETF) that provides a rate of return of 5%. To be financially secure, he would need $12,000/0.05 = $240,000 worth of wealth. 3. Peter wishes to attain Financial Security. He has an annual survival expense of $12,000. He channels his wealth into a portfolio of bonds that provides a rate of return of 3%. To be financially secure, he would need $12,000/0.03 = $400,000 worth of wealth. 4. Andrea wishes to attain Financial Independence. Her family has an annual survival expense of $50,000. She channels her wealth into a portfolio of stocks and bonds that provides a rate of return of 4%. To be financially independent, she would need $50,000/0.04 = $1,250,000 worth of wealth. 5. Mary and Melvin wishes to retire in 10 years. They estimate by then, their annual retirement expense is $80,000. They channel their wealth into a portfolio of stocks and bonds that provides a rate of return of 4%. To be financially secure, he would need $80,000/0.04 = $2,000,000 worth of wealth. In this way, their wealth machine(s) is able to distribute cash flows, yet will retain adequate asset value for it to consistently generate future cash flows. This wealth can also be passed down to the future generation (bequest to children). Financial Security is a stage in your path towards financial independence where the amount of wealth you have is able to provide for your annual survival expenses on an annual recurring basis. Why does having wealth that provides for survival that big of a deal? The first reason is that it gives you optionality. In a survey of millennials who wanted to venture into some form of side business, the main reason is not to have a huge amount of money to fly to a casino whenever they like and gamble away a large sum of money. The main reason is to have the option that if they are unhappy at work, or that when they feel their goals in life have changed, they can walk away from what they are doing at work without much worry. Your friends and you have been working on this side business part time for a while, and the chances that it will thrive looks real. They need one person to work on the increase number of orders. You could be that man. We do not know what life throws at us but with adequate wealth we can dare to pivot. The second reason is that, covering survival expenses means a much smaller amount to reach, as you will realize later in how we derive the amount. When the goal is much closer and its usefulness can make such a big impact, you feel more motivated to shift your beliefs and values towards it. At the end of 2015, I updated everyone on my annual family expenses, you can read it here. What is interesting is that, I realize the wealth that I have allows me to achieve financial security. It was earlier than I imagined and certainly not an objective I set out when I began saving money at 24 years old. The feeling is very different when I know I reach this stage when I have this option. Yet I still feel very motivated to continue to work yet it presents me with some options should life takes me in another direction. Financial Independence is a progression from financial security where the amount of wealth you have is able to provide for your annual expenses (including survival expenses) on an annual recurring basis. When your wealth is able to consistently cover your current annual expenses, and yet grow at a rate higher than inflation, you can realistically not depend on the job anymore. Financial independence looks the same as retirement or early retirement, but the idea is that financial independence means optionality, that you do not need to retire if you are happy and feel like contributing to your profession. The misconception of how early retirement looks like is one where you go on holidays every week or sit at home do nothing. I realize that if you are at 45 years old and you have enough to retire, you might live as long to 100 years old with advances in medical technology. That would mean 55 years in retirement. At some point going on holidays and doing nothing would eventually feel like another job. In that sense, a 35-50 year olds mind is rather active, and a sudden change in environment to an aimless one can be quite detrimental. A feeling that suddenly no one depend on you anymore may make you feel rather useless and perhaps a reason why a lot of health problem occurs after retirement. If you read the Sunday Times and they keep asking these folks when they want to retire or what they will do in retirement, they gave the same answer. They don’t want to stop working. How much you need to accumulate is explained. However, we need to expand on the rate of return. Our explanation on top is to help you understand easier, but it doesn’t factor in a vital need. Your wealth machine needs to keep up with inflation. If you need $20,000 in your annual expense for the next year, inflation will result in a loss of purchasing power. What this means is that if you need $20,000 today to purchase this amount of things, 10 years from now, you will need an amount that is much larger than this, in order to purchase the equivalent of the SAME amount of things. The problem is inflation is not fixed. Inflation could be more than what it was in the past, it could be less than what it was in the past. You might also have a different inflation rate than your friends because you may be more frugal, or spendthrift then them. Some expense items grow at a much faster rate than others. We could assume an inflation rate that averages 3%/yr. The amount of wealth you need to accumulate for FS/FI/RET stays the same, and so do the amount you need as annual expenses. To re-frame in another way, the long term average return of various forms of wealth machine(s) might be higher at 5%-10%, but you cannot spend at that high rate. You have to prudently withdraw only a lesser % of your wealth machine(s) as cash flow so that the wealth machine can last long, and still have adequate assets to keep up with inflation. How does this work in practice. Let us take at Case Study 2, where Andy wishes to reach Financial Security with $240,000. For the initial year, year 1, he needs to spend $12,000/yr. Andy will withdraw $12,000 from his $240,000 he accumulated by age 40. He will spend this in year 1. At the start of year 1, his $240,000 will fall to $228,000. Over the course of 1 year, if the wealth machine grows at a rate of 8%, the $228,000 would grow to $246,240. Andy would withdraw his spending for year 2. To keep up with inflation, Andy would need to withdraw 3% more. At the start of year 2, his $246,240 will fall to $233,880. 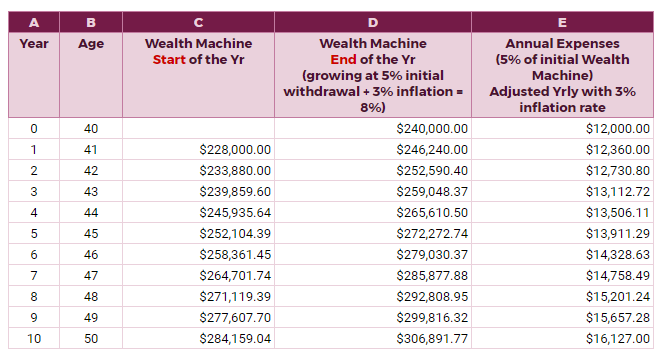 Over the course of 1 year, if the wealth machine grows at a rate of 8%, the $233,880 would grow to $252,590. The cycle will repeat. Notice that the annual expenses available for spending goes up, the wealth machine stays intact. This is the math behind. However, do note that for most wealth machines, things do not work out this way. The reason is that value of financial assets goes up and down. They do not earn an average 8%, 8%, 8%, 8%, 8% over the years. Due to that, it pose some problems. Read the related article for a strategy to tackle this issue. The rate of return required is an aggregate of the rate of return to generate your annual expenses plus the rate of return to keep up with inflation. The wealthy formula shows you how to accumulate fast or slow. This can be illustrated in the following table. If we take Case Study 4, where the family needs to withdraw at a rate of 4% (FI Tgt Withdrawal Rate below). 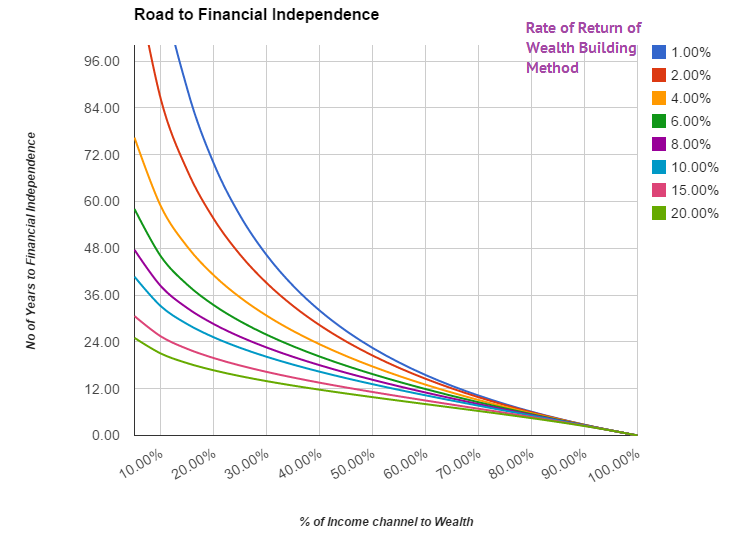 The horizontal axis shows the different rate of return of the wealth machine you would accumulate your wealth with, 1% being fixed deposits, and 20% possibly operating a successful business). The vertical axis shows how much you will put away from your disposable income into your wealth machine. You can put only 5% of the disposable income, or 100%. If you put 5% into your wealth machine, it means you have 95% available for you to spend. If you put 100%, that means you have 0% for you to spend (not quite possible). Each box shows how long it takes for you to accumulate the wealth to reach that annual spending level of yours. Observe that if you put a low savings rate of 20%/yr, the number of years to reach FS/FI/RET ranges from 69 years to 16 years. 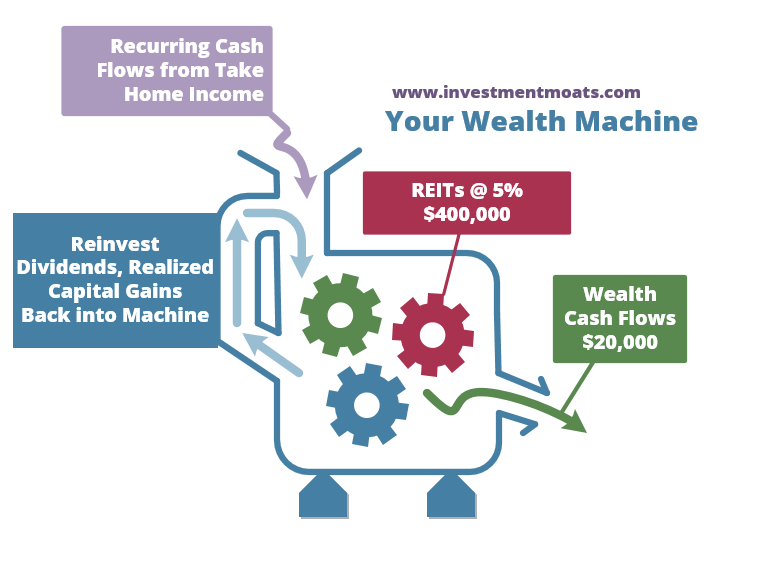 Your wealth machine rate of return is important here. But if your put away 50%/yr of your disposable income to your wealth machine, the range is smaller from 22 years to 9 years. The rate of return is less significant. 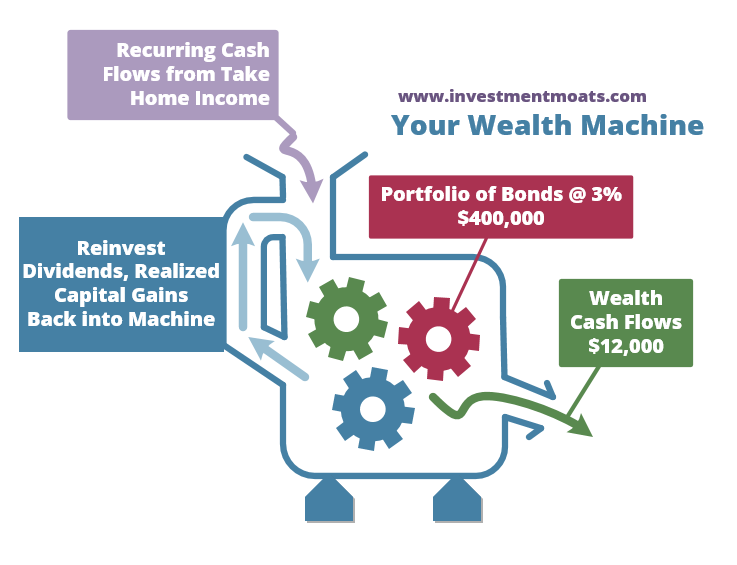 A high earner who puts away more into his Wealth Machine Fund, can use a Wealth Machine that generates a lower rate of return. A medium earner or low earner who cannot put a high amount repeatedly into his Wealth Machine Fund (he can try! 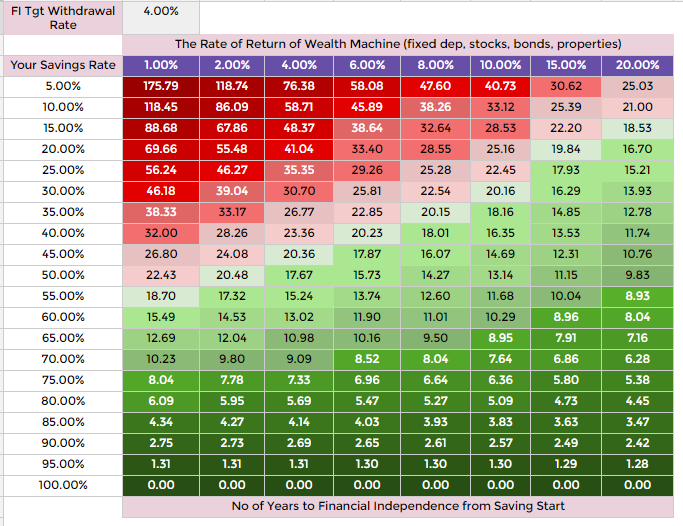 ), would have to leverage on a Wealth Machine that generates a higher rate of return. The above chart illustrate the table in a different way. It is the same depiction. For example, if you channel 50% of your disposable income to building wealth, the number of years to reach financial independence is 12 to 24 years. A friend of mine, does his own online business. He is naturally frugal without much additional wants in life. His take home cash flow is $80,000/yr. However, he spends only $18,000/yr. This means he has a net cash flow of $62,000/yr. To generate $18,000/yr, at a rate of return of 5%, he would need $18,000 / 0.05 = $360,000. Based on his net cash inflow, he could reach this sum in $360,000/$62,000 = 5.8 years. What he got in this case is a wealth machine, that makes him independent of his online business. We are not saying his annual spending will not change (in most cases it will change). However, my friend can always dig into his past and realize in a stage of his life, he could survive on $18,000/yr. He knows how to make himself financially secure. This frees him up to make a business pivot. He could channel the future $62,000 after those 6 years to start a non-profit endeavor, or another business he feels its viable. This creates a lot of optionality. A lot of the REIT investors will think “hey I can beat this with 7% yield and properties rental revise up with inflation”. your plan needs to be compatible with the next phase of your life. You may not want to look after properties or be consistently looking at a screen for long duration but more meaningful things. Have you factored that in? 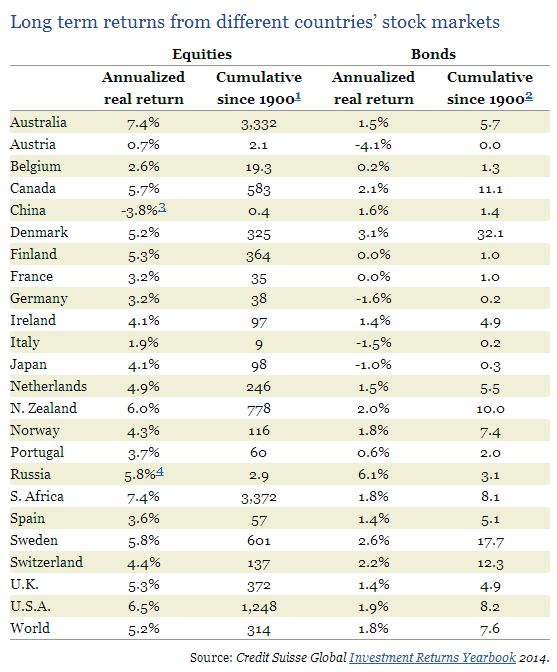 The table above shows the real return of the stock markets and bonds around the world. We observe that the rate of return can vary wildly. What we can conclude is to tamper with your expectations when you read articles using a rate of return of 8%. That may not always be the case. A lot of the materials are based on USA, and they are the “economic prom queen” for a long time. The real rate of return for your home market might be very different. It is better to be conservative about it. Use safer more predictable lower return instruments and plan with a more conservative rate of return. 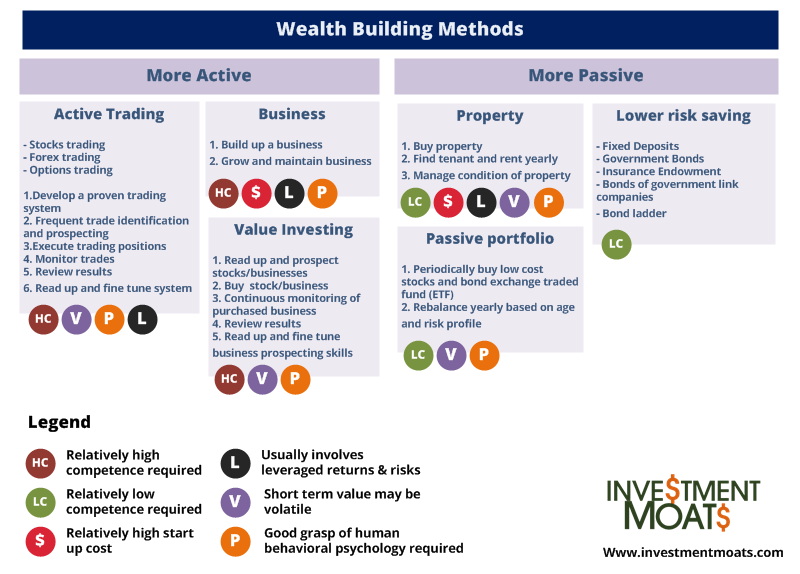 The way to plan conservatively is to understand the average rate of return of the wealth building method in the country you deploy the money in. If you are basing your wealth machine by purchasing real estate investment trusts (REITs) and bonds in Singapore, then take a look at the long term returns. Once you have that long term total return figure, use the figure and drop 30% of it. So if your total returns from your wealth machine is made up of a cash flow yield of 6%/yr + 2%/yr inflation growth (long term est for REITs), instead of using 6%/yr cash flow yield estimation, use 4.2%/yr instead. If your expenses is $2000/mth, or $24,000/yr, you will need a sum of 24000/0.042 = $571,428. This is the conservative figure, where your expenses will grow at 2%/yr inflation growth roughly. Could you use the 6%/yr figure? Yes you can, but you have to know the caveats or assumptions of using that. Returns do not go up in a straight line, they can be volatile and go up and down. If you use 6%, you will need 24000/0.06 = $400,000. This is a smaller sum that you can aspire to hit, and your 24,000 can grow at the 2% inflation. However, there will be years where you cannot withdraw the full 6%. 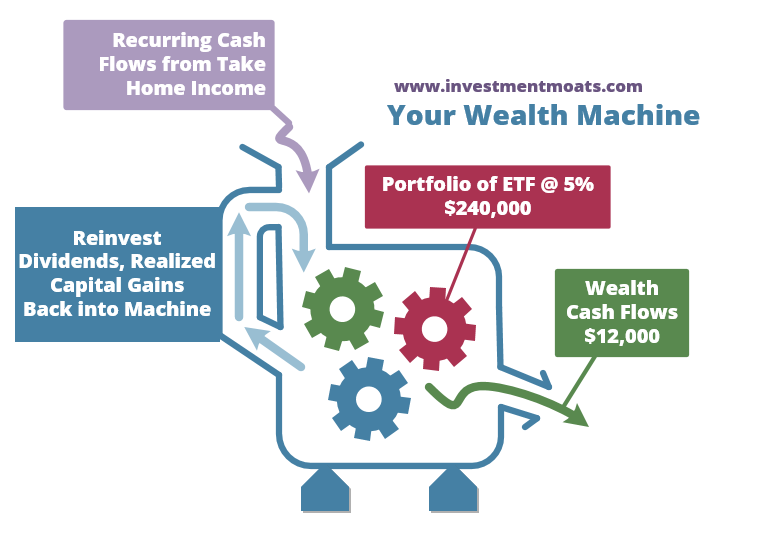 The 6% Rate of return of Cash Flow required for FI creates a lower Wealth Machine Fund of $400,000 to aim towards. There are retirement or wealth builders who have limits, or that they have other life aspiration goals that they would want to spend more their time on instead of at work. You can have a less conservative rate or return estimation provided you know the caveats. Not just that, its better you have some ‘blueprint scripts’ that guides how you withdrawal your money from your Wealth Machine Fund so that they do not deplete your Wealth Machine Fund in bear markets due to sequence of return risks (read here why sequence of return risk matters). I have written a guide on variable withdrawal strategies that can guide retirees or people in FI to vary how they withdraw their cash flow from their Wealth Machine Fund, with a less conservative withdrawal percentage and still do relatively ok. You can read Variable Withdrawal Rates that make $500,000 possible in FI. The beauty of this conservative nature is that at any point when the couple passes away, this portfolio asset can be passed on to the children or put into a trust where they can help make their life much easier. Theoretically, because the second part of the formula factors in inflation growth, the wealth never gets depleted. We hope that this puts questions in your head and sets you in motion to discover whether you can realistically aim for financial security. I do find it to be a more worthwhile goal to pursue versus financial independence or retirement. Perhaps start today and have a conversation with your spouse, whether both of you can sacrifice a bit to work towards a state of life where you can move on to do something you like. Good post. Sets people thinking about balancing work and personal life based on one’s actual needs and wants. I am also thinking about financial independence over the past few years. I think I am heading in that direction, but something needs to be factored into account, which is healthcare costs, especially inflated healthcare costs as the years pass. We may be able to predict the amount of money we need for FI e.g. $2000 a month, but we cannot predict the amount of money we need when we fall sick one day, when we need to be hospitalised, when we need to consume medication amounting to $50 a day. We can have hospitalisation and critical illness insurance, but hardly would they cover subsequent claims e.g. relapse of cancer. Do you have any insight to this? Hi Jomel, great that you are on your way. What you asked is difficult and perhaps you would have to run through your simulation. whether disabiltiy income insurance covers that, what is the plan after 65 years old. We have no choice, we have to read more and piece the plan together. did something happen close to heart that cause you to evaluate this? Not exactly that something has happened. Appreciate your concern. 🙂 Rather, I think that your scenarios can be a little too optimistic that may not take into account potential outflows of money when crises struck. Moreover, I have worked in the insurance line before and heard of cases where claims for relapse illnesses cannot be made. Quite scary if you ask me. If you ever can simulate such scenarios, I would be eager to read it. hi Jomel, thanks for sharing. what you meant is that a relapse takes place and the person couldn’t work, disability income not enough, and that hospoital and surgical couldnt cover? perhaps that is roughly you can, but the problem is whether that is a true north or something we can work with. I always go through this exercise so that we arrive at something realistic and applicable. Kyith, in theory I agree with your methodology to generate income as well as increase the principle over time. However, in practice, we will not be able to obtain constant rate of return (said 6.33%). Market goes in cycle. The historical long term return stock market may not repeat by itself. For example, Singapore GDP has “peak” and PM Lee said that he will be happy if the GDP growth is ~3%. With ~3% growth, it is thus not realistic to say 6% return is conservative. Hence, the tough part is to grow the wealth with CAGR of 6.33%. I beg to differ. I am not the best person to ask but what I remember is that the yield that you should get is gdp + inflation + current dividend yield. I remember that from gmo, who are the ones very well verse in this. Having said that, I am not referring to one asset but it could be a Vanguard world stock market etf, a portfolio of dividends stock, a rental property.